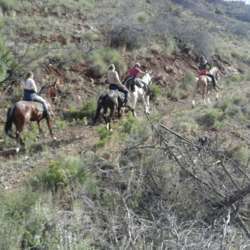 Would you like to enjoy a beautiful horseride and ride 3,5 hours on horse? We will meet at Protected content I can also collect you from the parking place out side Miramar, near the fire station, if you wish to. In that case let me know upfront so we set a time. From el Rengo we go on horseback to Esparragal where we have a short break. Then we continu at direction Entrerios, Atalaya. After +/- 1:45 hours ride we will stay for 30 minutes for having lunch at a bar and a rest. After that we continue our trip back to el Rengo Mijas during 1:45 hour again. Don't watch your watch to the minute, as we will have all the time to enjoy our day. The trip will be mostly in walk but there are spaces on the way back where you can have a controlled cantar if you whish to. All riding levels are welcome, for the advanced riders there are stallions or more energetic horses to ride on. Might be that some horse owners from the stable ride along on private horses if interested, so the size of the group may vary. For your comfort we recommend, Jeans, Cap, Shoes or Boots with heels. If you have a helmet just bring it. Otherwise we can lend you one if you want to wear one. Max. weight of participants is Protected content . Lunch, tapas and drinks are at own costs and not included.